The skills.lab in Wundschuh – a village to the south of Graz – is open to the public: The soccer training facility of Anton Paar SportsTec GmbH can now be leased by sports enthusiasts, small groups, soccer clubs, and is also available for company events. Well-known people from the world of professional soccer, such as the former “SK Sturm Graz” trainer Ivica Osim, as well as many teams and players from the German and Austrian national leagues have already visited and tested the innovative training system from Anton Paar SportsTec GmbH. Amateur and professional soccer players from the region are already training regularly at skills.lab. The skills.lab is located in a large building in the village of Wundschuh, to the south of Graz. It allows people to train and refine various aspects of their soccer skills. Whether this is passing, shooting goals, or general game-play: The facility can be adapted and set up to suit the individual requirements of each participant. People can train alone or in groups. The training begins on the 320 square meter turf area, which corresponds to the average space a player has in a real match: The individual’s choice of music or stadium noise can be played in the background. 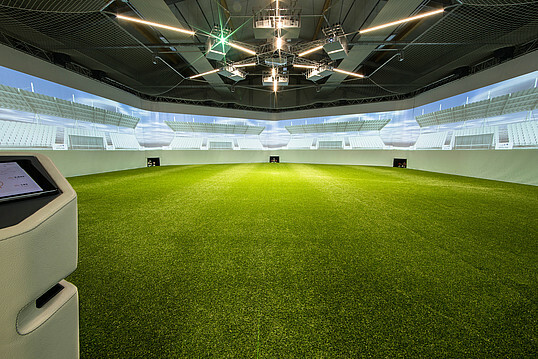 A virtual soccer arena and virtual players are projected onto the walls of the facility. The ball is passed in with up to 130 km/h, lasers highlight the goal. The training progress can be measured and displayed in real time. The customers can easily evaluate their trainings via an app on a tablet. At the moment skills.lab offers 35 different training programs with five different levels of difficulty. The performance of every player is recorded in a database and the training progress documented.